Steve Glanstein, a professional parliamentarian, specializes in the most contentious of condominium board meetings. Above, he unfolds his portable lectern in front of the Marco Polo , a condominium with a turbulent past. Par · lia · men · tar · ian: 1. A person who advises a chairman or presiding officer about matters relating to parliamentary procedure. 2. a specialist in parliamentary procedure 3. must know Robert's Rules of Order, and pass an exam 4. when working with condo boards, must have thorough knowledge of bylaws. The state does not issue licenses for parliamentarians, although certificates are issued by the National Association of Parliamentarians upon the passing of a written exam. The Hawaii State Association of Parliamentarians is affiliated with the national group. Hawaii has about 42 members, 11 of which are professional registered parliamentarians. A registered parliamentarian has passed a 1,200-question written exam while a professional registered parliamentarian has taken a 12- to 16-hour class, and been tested on bylaws interpretation and how to handle emotions. However, some potentially contentious environments -- such as condo association meetings -- call for more training and experience. Services: Coaching and preparing scripts for presiding officers, explaining proper parliamentary procedure, helping to execute procedurally correct elections, serving as a parliamentarian at meetings. Parliamentarian Steve Glanstein says 90 percent of all condominium board meetings run smoothly. It's the other 10 percent that he deals with. "Mine are the ones with problems," he said. A fistfight between 70-year-olds, a meeting held in Ilocano to exclude one member, a president too drunk to conduct business -- Glanstein has seen it all. In those cases, a parliamentarian can sometimes make the difference between peace and war. A parliamentarian helps make sure that meetings, whether of condo association boards or other groups, follow proper procedures according to the latest edition of Robert's Rules of Order. Glanstein likes his job as a "people calmer" to condominium owners associations. "It makes me think and use my mind a different way," he says. 514B-106(f) At any regular or special meeting of the association, any member of the board may be removed and successors shall be elected for the remainder of the term to fill the vacancies thus created. The removal and replacement shall be by a vote of a majority of the unit owners and, otherwise, in accordance with all applicable requirements and procedures in the bylaws for the removal and replacement of directors and, if removal and replacement is to occur at a special meeting, section 514B-121(b). Steve Glanstein, a self-employed parliamentarian, has seen it all. Battles between new homeowners and old homeowners, personality tiffs, a dividing line based on race, and a fistfight by two 70-year-old board members underneath the meeting table. He's even ducked a couple of blows himself while presiding over a community association meeting on Maui. The would-be attacker apparently took a swing at him because he was answering a procedural question from the other side. Luckily, Glanstein, 53, also knows aikido and how to avoid blows. As the owner of Management Information Consultants, Glanstein, who gave up computer programming to be a parliamentarian, doesn't have anything to do with making up the rules. A parliamentarian is a consultant, hired sometimes by an attorney or an individual to make sure that meetings, whether it be a condo association board or a non-profit board, follow proper procedures according to the latest edition of Robert's Rules of Order. Sometimes, he chairs a meeting on behalf of the board president, who may be inexperienced -- or, in one case, drunk. But his role, he said, is to explain the rules, get people to vote on items, and say when certain motions are out of order. Glanstein also finds himself as a "people calmer." Once, he said, he had to calm a 300-pound man down about not being able to park his boat in his driveway. Glanstein does little advertising other than the phone book -- most clients come about through word of mouth. His average charge is about $150 an hour, from port to port, not including travel charges. Susan Govier, also a professional registered parliamentarian, works mostly with groups like 4-H or smaller organizations like an orchid growers' club. Other parliamentarians work with unions. Condo boards are challenging because it involves people and their investments, said Govier, which are sometimes their life savings. More experienced veterans, like Glanstein, work with condo board associations. "We have found parliamentarians most useful in board removals," said David Grupen, a condo specialist with the state Real Estate Commission. "If someone calls, we'll oftentimes let them know other associations have found parliamentarians useful in board removals." The process by which condo owners conduct a board removal depends on each property's specific declarations and bylaws. The Wailana at Waikiki is one such condominium association that recently usurped its nine-member board, and then put in a new management company. Hawaii First was selected from several bidders by the new board as its property manager for Wailana, replacing Metropolitan Management. 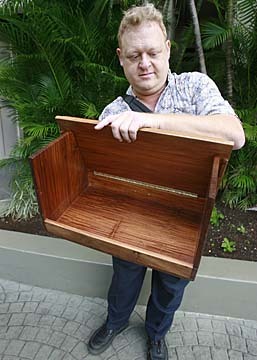 Owners at the Wailana, a 180-plus-unit condominium in Waikiki, took matters into their own hands by taking advantage of a state law -- 514B-106(f) --that allows them to call for a special meeting and removal of the board. Board president Jim Kowalski declined to go into details about what transpired at the Wailana, saying only that there had been no wrongdoing on the part of the previous board. "There were disagreements on priorities, basically," said Kowalski. "There was no misconduct or misbehavior. It was a matter of certain things to be done sooner rather than later... A group of owners decided it was serious enough to go ahead and force this process." Some property managers say it's an unusual maneuver, but Glanstein says he's seen it many times. He's seen two boards removed this year out of seven attempts, so far, and knows of possibly three more in the next couple of weeks. Glanstein, who fields between 50 to 70 cases a year, said one of the most challenging tasks is to oversee these removals, whether it's just one member or the entire board. He says the most common causes of an upset board are the dismissal of a popular resident manager, failure of the board to keep adequate reserves and thus, passing unexpected costs on to the owners -- and most often, personality conflicts between people who find their way into the boardroom. Sometimes there are two groups with differing philosophies: micromanagement vs. laissez-faire, one side that made money by saving it while the other side made money by spending and investing it. He's seen one ethnic group vs. another, even one board that, because they didn't like one member, decided to conduct all business in Ilocano, a dialect he wasn't able to understand. Mixed-use condos often have numerous issues, when the interests of businesses are not balanced with those of the resident owners. With newer condominium developments, he said once control transitions from the developer to the board, some construction and operational issues could result. Owners sometimes balk at sudden changes made by a board, such as an increase in their maintenance fees. Sometimes the property is encumbered by a set of documents heavily biased in favor of the developer and a favorite property management company. If one member of the board has a restraining order against another, then a police officer has to be present. There are oftentimes lawsuits involved. He jokingly refers to one particularly troubled group on Maui as the "Abu Ghraib" community association. "Every time I think I've seen it all, something new comes up and surprises the heck out of me," he said. It's clearly a potentially dangerous job that requires good people skills. 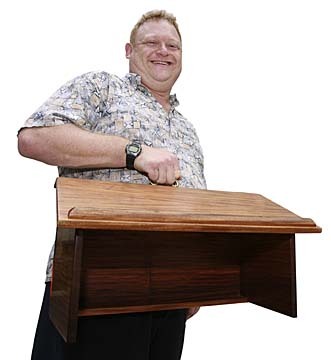 Glanstein carries a portable lectern which he uses to preside at meetings. The front has an insert for a bulletproof shield -- to protect your chest, said Glanstein. But so far, he hasn't found the need to bulletproof it. "It's challenging," he said of the job. "It makes me think and use my mind a different way." At Marco Polo, a 586-unit residential high-rise, board meetings, known to be more turbulent in the past, have been calm for several years. The board has used Glanstein as it's parliamentarian for at least 20 years, more as "preventative maintenance" rather than because of a current conflict, says general manager Robert Allman. Allman says, given that the Marco Polo has such a large number of owners, it's useful to have a parliamentarian present to keep the meetings running smoothly. In those case, he or she can be as essential as the rest of the business team. "They don't make up rules, but they help keep the flow going," he said. "A parliamentarian takes the emotion out and runs a meeting that's fair to everyone, and which accomplishes more business." Glanstein says the cardinal rule for board conduct goes back to what we all learned in kindergarten: Work well and play well with others.